[From IMDB:] A young boy and his friends face off against a mysterious grave robber known only as the Tall Man, who keeps a mysterious arsenal of terrible weapons with him. I dunno, guys. Between my take on Suspiria and now this movie, I feel like my claim to be a fan of classic horror movies is being seriously tested. Because, this? This I did not like. Before I get into why, though, I do want to say that (again, like Suspiria) I thought the score for Phantasm was great. It really carried the movie in terms of developing any kind of ongoing tension, and its emphasis on discordant tones brought a sense of not-quite-rightness that was integral to the plot. A. Michael Baldwin didn’t do too bad a job as the protagonist Mike, either – even if he was a bit of a creeper at various points during the movie. Unfortunately, that’s where the positives stopped for me. The story was all over the place, with no obvious motivation provided for anything that happens in the movie. It also had a habit of jumping from plot point to plot point, without any clear resolutions. And while some might say that the revelation at the end of the movie might explain away these issues, I reckon that’s just a cop-out for bad storytelling and editing. 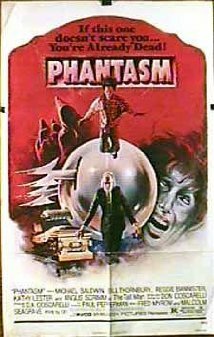 There was also very little about Phantasm that was scary; in part, I think, because the halting way in which the movie progressed made it hard to become immersed enough for the few jump scares to be effective – particularly given most of them involved Jawas. Honestly, the most enjoyable thing about this film was when my brain randomly decided (toward the end) that, if viewed as a non-musical prequel to The Rocky Horror Picture Show, it actually made more sense. Take that as you will.